I am a big fan of crowlers. There are several reasons why. I seriously doubt that I need to explain the virtues of the crowler to fellow beer lovers. Simply put, the crowler is an idea whose time has come. For the uninitiated, crowlers are 32-ounce aluminum cans that a brewery or bar can fill with draft beer on request. This ultra-convenient “to go” beer option combines the deliciousness of draft beer with the convenience of an aluminum can. Today I share news of a crowler rewards program, another idea whose time has come. 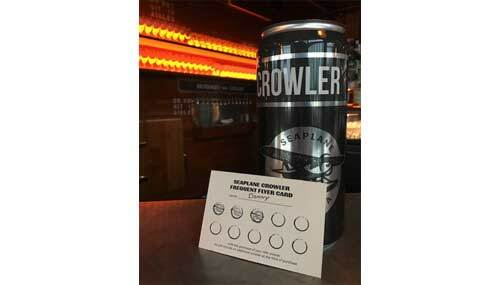 Seaplane Kitchen and Bar in Kenmore, Washington is the first place I’ve heard of that is offering a crowler rewards program. It’s a simple deal: buy 10 crowlers, get the 11th gratis. Brilliant. No doubt, others are offering similar deals, I just haven’t heard. 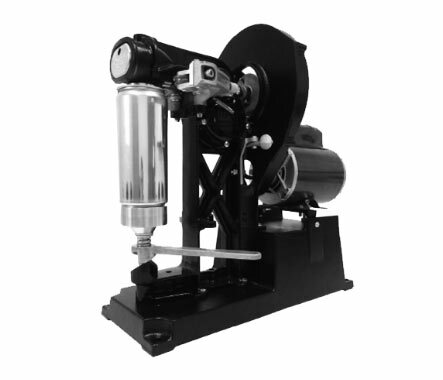 Pictured above, a Crowler Machine, also known as a tabletop can seamer. Known as the “Frequent Flyer” program, beer lovers can try out a variety of beers at Seaplane and then take home a can (or two or three) of their favorites. When you fill up a crowler, they’ll stamp your punch card. When the punch card is complete (10 beers), you are rewarded with an 11th crowler. Last I checked, the draft beer list included offerings from Bale Breaker Brewing, Breakside Brewing, Fort George Brewing, pFriem Family Brewers, Holy Mountain Brewing, Crux Fermentation Project…. you get the idea. Good stuff. Behind the scenes at Seaplane Kitchen and Bar you’ll find some heavy hitters from the local food and beer scene. Jason Stoneburner is the Executive Chef and Co-Owner. The restaurant and bar is related to some familiar local eateries and drinkeries, which the refer to as sister restaurants: Rhein Haus, Poquitos, Beer Star, Stoneburner, Macleod’s, and Bastille. Located in Kenmore, Seaplane Kitchen and Bar is another breath of fresh air for this long-dormant community. For reasons I cannot explain, Kenmore seemed to languish for decades. Nice neighborhoods full of nice people with no place local to go. If there was any kind of city center, it offered little character and no real charm. In recent years, something has changed up there at the north end of Lake Washington and it’s a change for the better, as evidenced by the opening of a place like Seaplane Kitchen and Bar. Other businesses have popped up in recent years along that stretch of Highway 522 (NE Bothell Way). As beer lovers know, Kenmore is home to Cairn Brewing, Nine Yards Brewing, the Lake Trail Taproom, and Micro Homebrew, all located within a couple blocks of each other and within a couple blocks of Seaplane Kitchen and Bar.